« It’s National Cat Day! I continue with another exhibit from Zagreb’s Museum of Broken Relationships, a truly remarkable place. Each item was donated by someone involved in a “broken relationship” (mostly romances but some parent/child relationships), and the donor wrote an explanation of the circumstances. This entry was written by whyevolutionistrue and posted on October 29, 2018 at 2:30 pm and filed under museums, romance. Bookmark the permalink. Follow any comments here with the RSS feed for this post. Both comments and trackbacks are currently closed. That’s just cold. To spend 30 years with someone only to be kicked aside like a bit of rubbish…makes me wish I find find this person and give a her a hug. 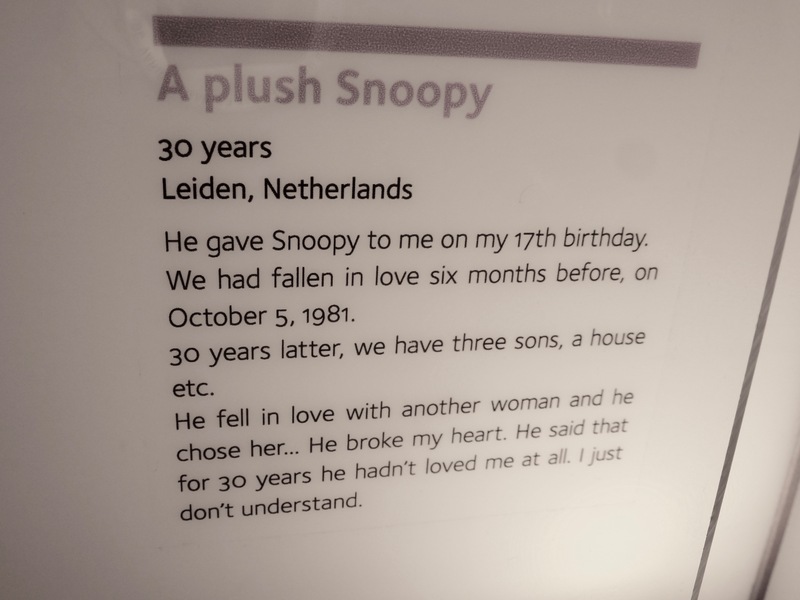 She should have kept Snoopy – he’d never have let her down like that. A colleague of mine dealt with something similar. 35 years of marriage and he ‘fell out of love’. I can’t help but think he would have been better to just let her know years earlier. By that time, don’t we all sort of count on making it last? he hadn’t loved her at all in the 30 years is just so….oy! I have no words. At first, I think this is not possible. No one could be that cruel, but maybe she did not fully understand that he, did, in fact stop loving her years ago and she either was living in denial or oblivious. 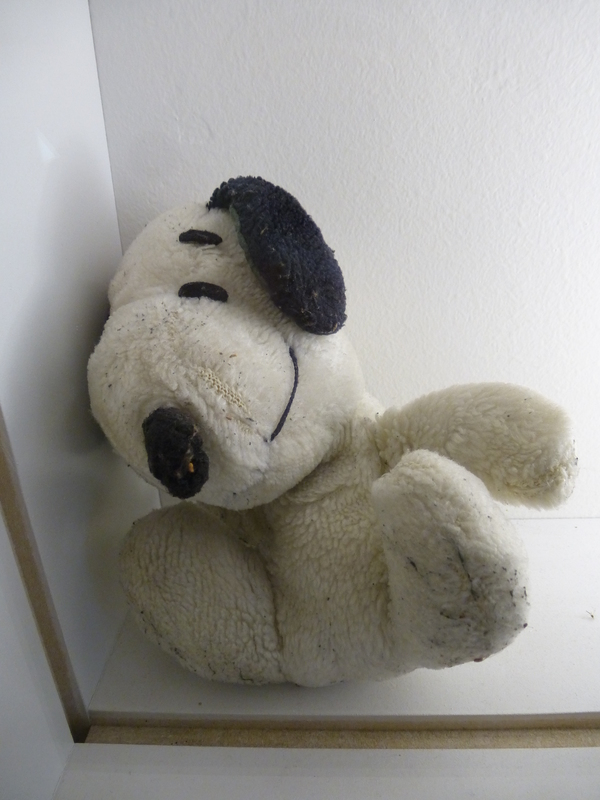 Still, cruel story to include Snoopy. My hypothesis – they got married way too young (happens all the time) and after a couple of years the guy realised he didn’t love her but he hid it for 30 years for the sake of the kids – and his wife. Then at 50 he had a mid-life crisis – ‘is this all I’m ever going to do with my life?’ and felt trapped in his marriage. Although we don’t know when they got married, they fell in love at 16, and teenagers are even worse than adults at choosing partners. And people change so much more between 16 and 26 than they do between 26 and 36 or 36 and 46, that it’s just so much more likely that they’d soon grow apart. This is desperately sad. I feel so sorry for her, but I understand the man’s feelings too. At 17, you don’t really know whether you’re in love or not, though whether you really are or not, it still feels like the real thing. Some people manage to keep loving the same person when they grow up, but it’s rare. I’d go along with the advice of infiniteimprobabilit above, though what do I know? I’ll be 55 in 6 weeks, and I never made it down the aisle. I can’t imagine it’ll ever happen now. Yes, it is so sad. One would think he would have at least cultivated a platonic love for a partner in life, and let her down slightly more gently with that. I did marry rather young. It’s been years now, but there have been challenges due to that. I converted to my partner’s faith when dating (barely out of my teen years). I’m not religious any more. I’m also not a teenager any more. I’ve grown and changed – which is what I would hope! I don’t want to be the person I was at 19. I think the key is trying to grow along with someone and to respect the person they are – the dynamic human – and not the still shot of youth. Things happen, life happens. What we have is the choice of how to go about living with those things. I like what you wrote. Her husband of 30 years left her for another woman. I don’t understand how the husband could say that he hadn’t loved her at all. What a mean thing to say to his children’s man. It just added more hurt. I sure hope that her life has (had) come back better without him. In my former industry, we were party to many important life moments. Births, deaths, marriages, acquisitions of property, etc. I can recall more than one meeting where one partner well into a marriage announced they had finally ‘found their true love’ and bailed. It is always sad, but usually for the best. That ship has sailed. I do sort of begrudge the ones that deny they let their ship sail for many years, denying their partner the chance to be with someone who wants to be with them. This reminds me of Bertrand Russell’s description of how he left his first wife. He was riding his bicycle and it occurred to him that he “no longer loved her”. That’s pretty much it. This was not after 30 years. Much less as I remember, but, for some reason this happens. Falling in love, it seems, is a complex psychological/physiological condition that can be reversible. I think avoiding the conclusion until much too late is the sad problem. How can anyone be so cruel? He could have fibbed and said “I’ve fallen out of love with you.” Still awful, but it might soften the blow a little. I bet this new woman was 20+ years younger.